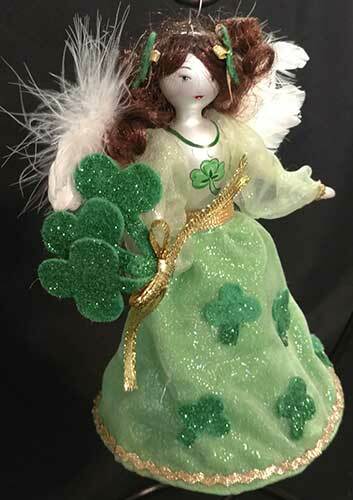 This Irish Christmas ornament features an angel with auburn hair along with wings that are fashioned with real feathers. The Irish angel ornament is made of blown glass and is enhanced with a double layer shirt with a wire rim and glitter accenting. 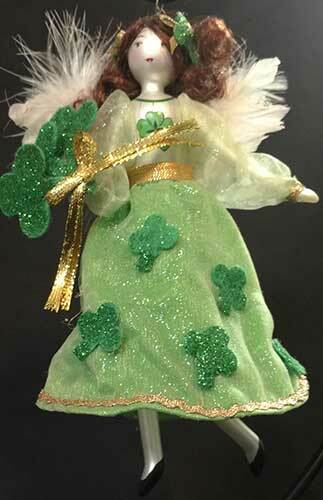 The glass Irish angel ornament is further enhanced with shamrocks on her skirt and chest along with additional shamrocks in her right hand and in her hair. The Irish ornament is a large decoration that measures 5 1/4" wide x 8" tall; she is gift boxed with a shamrock history card, complements of The Irish Gift House. 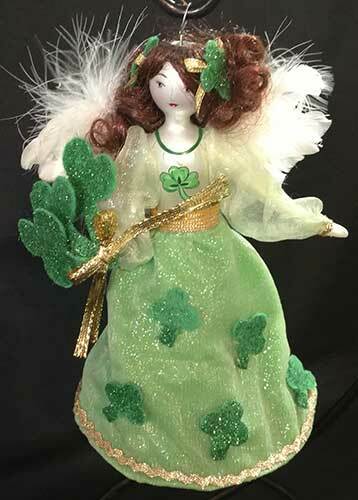 Irish angel Christmas ornament features a porcelain design that is enhanced with shamrocks. This porcelain Irish Christmas ornament features a guardian angel that is enhanced with shamrocks and roses along with a blessing.